The implication is that Social Objects work within your particular circle as anchors around which to have discussions. Outside that circle and when dealing with strangers, Social Objects serve as Social Markers as a kind of shorthand. “I’m a Christian” serves as three-word way of expressing a whole worldview, expected way of acting, and (perhaps) engenders a level of trust. “When I visit San Francisco I am always surprised how often the name of my friend, Robert Scoble comes up in random conversation, unprompted by myself. Why is that? Why is he so well known? Is his blog REALLY that good? Is he REALLY that smart and interesting? And, of course, as soon as someone become a Social Marker, they’ve got it made. People position and, to some extent, define themselves in relation to the Social Marker. They have an opinion on them/it, they have a relationship with the Social Marker – as does the person they’ve just met. These relationships with the Social Marker are then bridged forming a new connection based upon common ground. Social Markers are nothing new and people have attempted to find some form of commonality, presumably, since the dawn of (human) time. Where it was probably more useful in the way of life preservation, it’s now a handy way to establish yourself as a node on a network and gain instant social cachet. In both examples the use of Social Markers is method of positioning. Decide on something you’re interested in. Find out what it’s called. If it hasn’t got a name, make one up. If it’s new, take every opportunity to explain to others what it is. Become known for that thing. This can be as easy as expressing an interest in something, asking people to share examples with you, and re-sharing them back (in a curated form) with the wider community. Tell people what to do with your stuff. Share this, amplify that. Seth Godin is awesome at, essentially, instructing people how to share his ideas and brand. Big up other people.When people use your ideas, express something you find useful, or share what you’ve created, collated or curated, thank them. Celebrate the formation of a community around an idea. Don’t charge fans Social Markers are, naturally, usually paid for their opinions and work in their area of expertise. Don’t charge the fans to make money, charge the people who want bespoke work or publishers. Don’t milk the community dry. Who do *you* know who’s a social marker? This week we’re going to be looking at three tools. I’ve labelled them ‘microblogging’ tools, but that’s something of a misnomer as they’re all much more powerful than that. If you do actually just want something to quickly and easily get content onto the Internet, try Tumblr or Posterous. They all have slightly different uses and focuses, but I believe that they can all be used successfully within educational environments. I’ll discuss each in turn, looking at the features specifically relevant to educators. Obstensibly, Twitter is a micro social networking utility designed to answer the question ‘What are you doing?’ In practice, it’s used for a multitude of other things, from news reporting to marriage proposals(!). Educators have been using Twitter ever since it was launched to connect to one another and share ideas, resource and links. There’s an element of social networking in it, inevitably, but it’s very professionally-focused and a wonderfully powerful thing to tap into. Check out that user’s network and read the mini-biographies. Follow the users who look like they are related to something you’re interested in! Sending a ‘normal’ message that goes out ‘as-is’ to your network. Replying to someone (or bringing something to their attention) by including their username preceded by an @ sign – e.g. @dajbelshaw then message. This can still be viewed by everyone who’s following you. Sending a direct message by entering d <username> – e.g. d dajbelshaw then message. This can only be seen by the person to whom you sent the message and they will receive an email informing them of what you have sent. Edmodo provides a way for teachers and students to share notes, links, and files. Teachers have the ability to send alerts, events, and assignments to students. Edmodo also has a public component which allows teachers to post any privately shared item to a public timeline and RSS feed. Although I haven’t used this with students yet, I know people who swear by it* and I’ve explored the features using test accounts. Certainly, if your school VLE isn’t up to scratch – or if you haven’t got one – you should definitely be checking out Edmodo! Networks on Shout’Em are “lightweight social networks”. They have small set of features: microblogging, links and photo sharing, geo location sharing and mobile browser support. I think Shout’Em is probably best suited for those who want something a bit more engaging than a forum for their students, but not anything as full-blown as Edmodo. Shout’Em enables you to have a private community, like Edmodo, and they’ve even entitled a blog post on their official blog The 15-Minute Guide to Microblogging in Education! Do any of these ‘microblogging’ services fill a need? Have you tried any of them? What did you think? edte.ch barnraising: get involved in forming a community! However, sometimes it’s easy to feel overwhelmed and lost. How do you get in touch and interact with those facing similar situations and challenges as yourself? In addition to a network, there’s a need for groups. I want it to be a grassroots community, a place for postgraduate students to find people to bounce ideas off, an arena for instructional technologists to discuss barriers and opportunities. But I need YOUR help to get this off the ground. If you’re an educational technology professional or student, imagine the type of community to which you’d like to belong. Imagine how you’d interact with that community. *Wondering what I mean by ‘barnraising’? 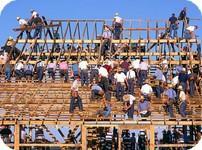 It’s a predominantly Amish practice and a two-day event where the community comes together to build a barn. I first came across this in the film Witness.